The Tronc Creux is a tiny cylindrical home that acts as a shelter for adventure seekers. 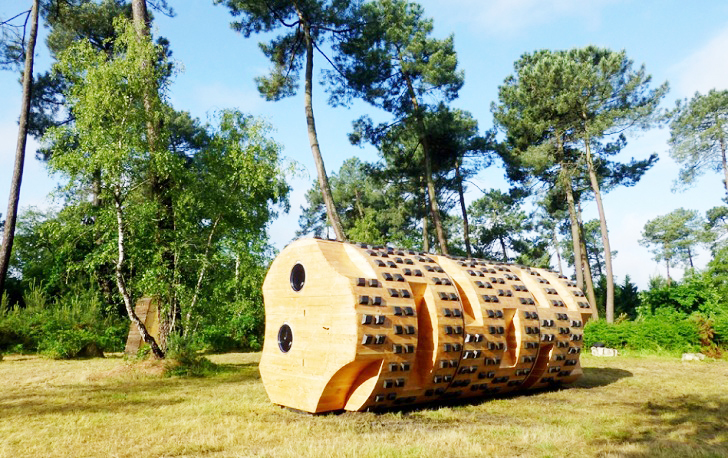 French architects Bruit Du Frigo conceived these low-tech retreats scattered across the forests of Bordeaux in France as hollow logs that provide lodging for hikers on a trail that connects several parks, forests and waste lands in the area. The shelters form part of a larger project that aims to promote a new form of tourism in southwestern France. It supports the development of suburban areas and urban peripheries as new playgrounds for adventure and exploration. The shape and overall appearance of the structures make them inconspicuous, similar to natural shelters found in mountains. With no electricity or water, the Tronc Creux offers basic living conditions that bring hikers closer to nature and recreate the primal experience of being outdoors. These off grid shelters act as hybrid structures-something between architecture and nature-that accommodate up to nine people. The cylindrical volume is built around a steel frame and enveloped in wood. The interior has three double beds and three single beds, while the tree-like exterior features spikes that are reminiscent of tamping wheels. Does anyone know the website to book the Off-Grid Le Tronc Creux Shelters in bordeaux? Cool! I love this place to live in. I hope someday I get this kind of setup on my own house, with more panels outside. The new shelters form part of a larger project that aims to promote a new form of tourism. It supports the development of suburban areas and urban peripheries as new playgrounds for adventure and exploration. The shape and overall appearance of the structures make them inconspicuous and similar to natural shelters found in mountains. With no electricity or water, the Tronc Creux offers basic living conditions that bring hikers closer to nature and recreate the primal experience of being outdoors. These off-the-grid shelters act as hybrid structures-something between architecture and nature-that accommodate up to nine people. The cylindrical volume is built around a steel frame and enveloped in wood.